Where are you going for the other 3.5 weeks of your trip? Any more skiing? We are in the UK for a week. 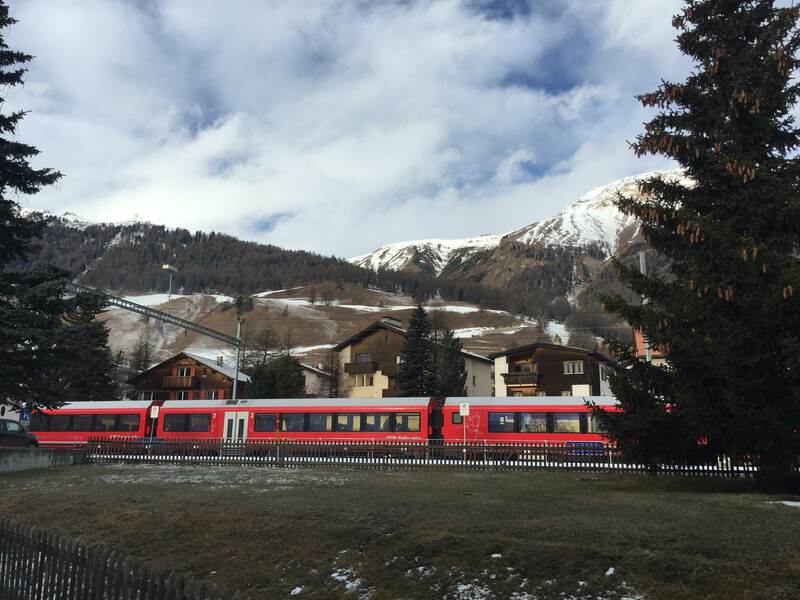 Austria for Christmas (Seefeld and Salzburg), Berlin for 4 days and then 4 days in Switzerland before travelling to Les Arcs. Not sure if there will be any other ski stops. I am gonna try and eek one out but my evil plan to skip the Sound of (bloody) Music tour got scarpered the other day, so not sure when I can try. I have 3 daughters, 1 is keen to find more time on the slopes, the others are not keen. Crazily they think 6 days at Les Arcs is plenty. Pffft! @Genista, I assume that you're aware that Seefeld has some lifts. Doesn't look like a huge ski area but would probably be fun for a day. Can you not squeeze a day in there? Haha - 1 step ahead of you. I was gonna try that one. We’re there for 4 nights. Hopefully they have a decent cover by then. Also they allow paying in 3 instalments at no extra cost which helps!! Charts looking better tonight (Australian time), if it stays the same there could be some white stuff late next week. Fingers crossed. Those of you turning 50 between 15 December 2018 and 27 April 2019 will get a free Les Arcs / Peisey-Vallandry day pass. If the lifts in 2000/1950 are closed the regular free bus round to 1600 and then 1800 opens up the other side of the mountain. There is tree line skiing over on the Peissey/Vallandry side which doesnt tend to be that busy. There is a free bus from 1800 to these villages if there are lift issues. Last year was a fab snow season and we skied to grange a few times for the novelty of it. The updated Comborciere will be a welcome improvement and will probably increase traffic to Malgovert. I don't know how the new hotel above 1600 will impact but I seem to recall talk of a new run taking you back from the runs down from Comborciere back down to the bottom of 1950/Pre St Esprit to add to the current black run that goes under the lift. Is there a new webcam in Les Arcs? On their webcam page called "Le Slalom"? Can't recall seeing that before. Looks it, but where is it? Covered in mist right now. You can scroll back one hour at a time to 'de-mist" it. It seem to be on a pylon in the middle of the piste just above the Vagere chairlift in Arc 1800. Seems a bit overkill to me as there is already a webcam just above that location at the Mille8 area, one on the roof of the EdenArc building about 100m away and I think there is a LiveCam at the Vagere chairlift as well. I think the cams are about to turn white again in the next hour or so...this time I think it will be more substantial. Bring it on! 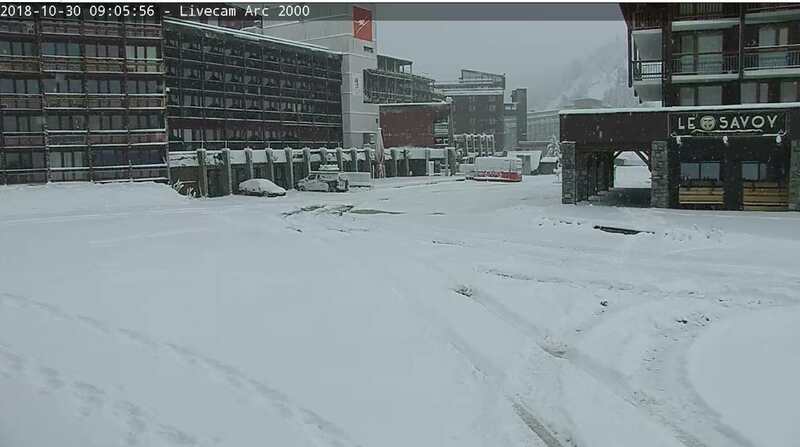 My guess is that the snowline will be high today, around 2,000m but dropping overnight so the cams should be whiter tomorrow than they will get today.. Yes, you could be right. Some flakes falling at Arc 2000 ATM, but it seems mixed with rain. At this time of year in Les Arcs I'd much rather see very cold temperatures than fresh snow with a relatively high snowline. Freezing the ground is likely to make more of a difference to early season skiing conditions than even a large amount of snow, which could melt all too quickly. Sorry, It is still October. I don't even get excited with snow in late November. In fact I am looking to go out in late November for a decorating (read walking) weekend and fancy a snow free resort. The flight are looking a silly price. A flight to geneva from Luton is a fraction of the train fare from Birmingham to Luton. Great to see the Winter arriving. Managed to get up in the snow on the way home. Even had a go at putting chains on. Always good to have a practice at winter driving when nobody is around. Emergency stops and skid turns can be fun, but not when it is for real!! News from the slopes is that the Comborciere Chair is nearly finished and so is Inversens Chair over the other side above Les Coches. Here are the web cam links so you can check out the slopes yourselves. The building works around Les Arcs is on going. AND in Arc 1600 the new Club Med is set to open in December. For those staying for a holiday. The discounted ski passes pre-season sale finishes on 31 October so hurry. For season passes you have until end of November. Check out the latest photos over on the Les Arcs Winter page. More news to follow as the season approaches. Didn't that season turn out to be horrible from late November to mid January? Yes. The snow was thigh deep at 1800m in early November, but nothing of any significance fell from then until early January. The skiing over Christmas and New Year was OK on piste, but got progressively worse as the holiday crowds turned. All the excitement in November, which was considerable, just led to a disappointing start to the season. Yeah I remember that season. This is Celerina and Corviglia during Christmas. There was around 40cm up top that season in contrast to 120cm this last one. No matter how long it lasts it looks nice on the cams. Any idea of how many cm are on the ground? Doesn't look like more than about 15cm...on the 1950 and 2000 cam. Haha - I am on an 18 week break from work, I got nothing better to do! I am definitely enjoying the pretty pictures for now though. After tuning in on the weekend I saw how quick it can all appear and then disappear. It's just starting to get warm in Australia..."they" are forecasting one of the hottest and driest summers for many years. You guys up there think you just had a hot summer up there... come down here in a few months and you'll know you're alive. 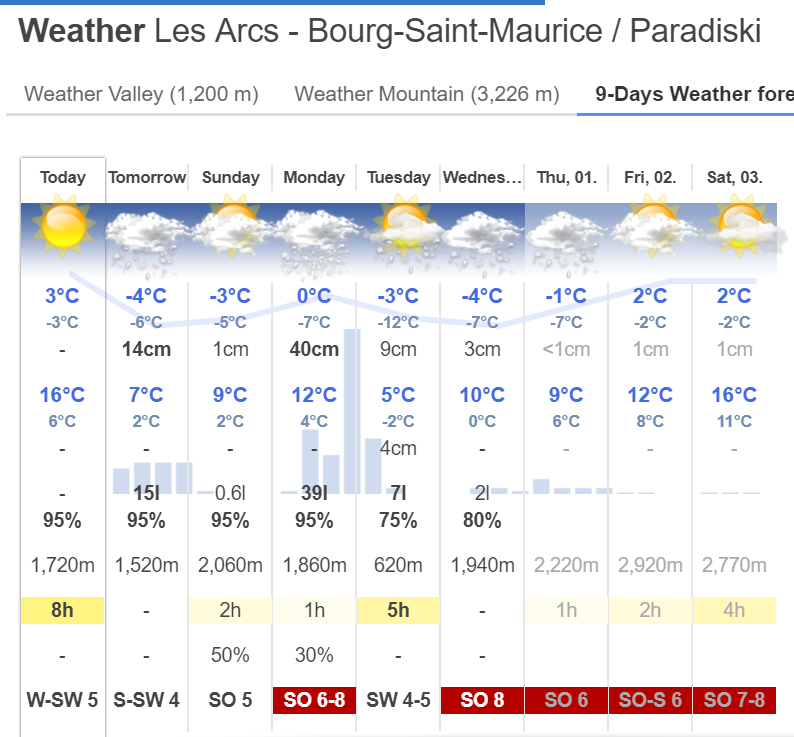 10-15cm at 2000m, 8cm at 1600m according to Les Arcs tourist office. As it was the Les Arcs TO are you sure there wasn't a 0 missing from the front of those numbers? Last day to get the 10% discount on non season ski passes today, in my experience the booking website can get a bit 'hinky' later on in the evening so if you are still intending to book I'd do it sooner rather than later.